Elizabeth Hopper in Editor's Picks Science & Technology on 20 September, 2016. 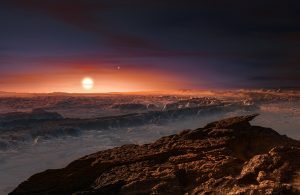 An artist’s impression surface of Proxima b and Proxima Centauri. In 2013, astronomers noticed signs of a small gravitational tug on our nearest star, Proxima Centauri. The tug indicates the presence of a planet – and according to their calculations it’s in the habitable zone. Since then, the planet has been dubbed a second Earth. It’s only 1.3 times Earth’s mass, is rocky like Earth, and, if it has an atmosphere to protect it against the harsh X-ray and ultraviolent bursts from Proxima Centauri, could theoretically support life. It’s initially surprising that the planet, which has been named Proxima b, orbits its star at less than five per cent of the distance between the sun and Earth. However, Proxima Centauri is a red dwarf star, so it is much smaller and dimmer than the sun. In fact, from the surface of Proxima b you would see the star as a dull red orb about three times the size of the sun. The surface temperature could be anything from -33°C to the high hundreds, depending on the planet’s atmosphere. The star and planet are also tidally locked, so one side permanently faces the star. An atmosphere, as well as protecting the planet from radiation, could even this out and distribute the heat evenly over the surface of Proxima b. As yet, we know nothing about the planet’s atmosphere, and at 4.35 light years away it seems unlikely we’ll find out any time soon. Our best hope is if the planet passes directly between its star and Earth (this is called transit). Then, analysis of the light passing through the atmosphere could give us some clues about its composition and features – but the chances of this happening are only a few percent. With today’s spacecraft, it would take 70,000 years to reach the planet. Some scientists want to send a probe, but this would cost billions. Luckily, there are other hopeful glimmers on the horizon. Firstly, when the European Extremely Large Telescope, or E-ELT, is built in 2024, we might be able to view the planet as a single pixel. Amazingly, monitoring this lonely pixel over time might be able to tell scientists about continents on the planet, and cloud patterns. Otherwise, the Hubble space telescope’s replacement, the James Webb telescope, is due to launch in 2018, so we might be able to observe Proxima b in the next 10 years. These are optimistic claims, especially considering that the planet could still only be a blip in the data. The team are fairly confident that the planet actually exists, though, having spent weeks trying to explain the planet away as noise from their measurements or Proxima Centauri’s activity, and then months examining data from other telescopes. “The first hints of a possible planet were spotted back in 2013, but the detection was not convincing. Since then we have worked hard to get further observations off the ground with help from ESO and others,” says astronomer Guillem Anglada-Escudé. However, there is one more mystery: the planet’s location. If the planet does exist, it is unlikely that the Proxima b formed where is currently is, since it is so close to the star. How did it form, and how did it get to where it is now? Knowing this could tell us more about the planet, including whether or not it is likely to have water on its surface.